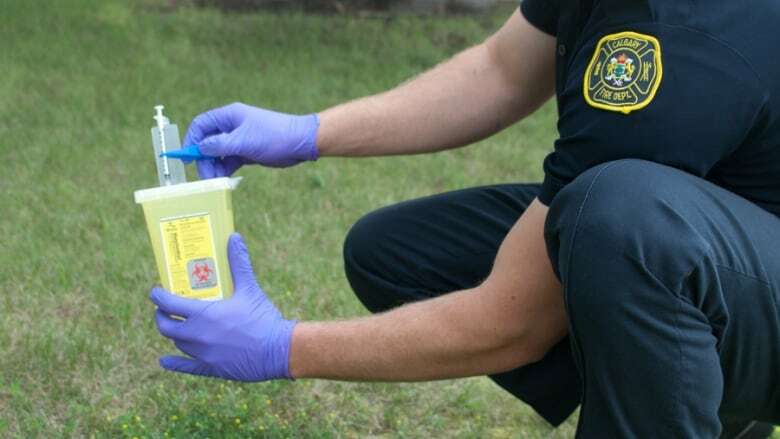 The Calgary Fire Department is seeing an uptick in the number of calls it receives to pick up discarded needles and drugs debris across the city. In eight years, those calls more than quadrupled. In 2010, the department received only 151 calls for needle pick-ups. Last year, in 2017, firefighters responded to 642 calls — an increase of 325 per cent. So far, the department is on-track to match or slightly surpass last year. There were 568 calls reported up to the end of October. "There is no area of the city that is really untouched by this issue," fire department spokesperson Carol Henke said. While needle calls tend to come from more densely populated areas of the city, needle calls are increasingly coming from outside the core, including the suburbs, the department said. And the calls share a similar pattern to opioid overdose calls. Jackie Liu, who works at the Alex Community Health Centre, said Calgary's drug problem is widespread in part because of stigma preventing some from seeking treatment. "You can have the fire department go out there and pick up needles all day long and they'll still be there if you don't deal with the addictions," Liu said. "In a wealthy part of the suburbs, perhaps you're not as willing to talk about your addictions issues, and we try to bring those barriers down so that folks are willing to at first come in." The city is partnering with groups, such as the Alex Community Health Centre, to develop an action plan to tackle drug issues, including paraphernalia litter. Anyone who spots a needle is asked to call 911 or 311 — and to ensure no one touches the debris.